Holy Shravana month celebrated with great enthusiasm and devotion in the worship of Lord Shiva at Sri Vishvanath Mahadev temple here at the Ashram. During this month 216 Rudrabhishek and Special Pooja were performed. Devotees participated in Abhishekatmak Laghurudras performed at Holy Shrine on each Monday during the Shravan month. This year two devotees have performed Sri Parthiveshwar Pooja during whole month and totally more than 80 Poojas were performed. 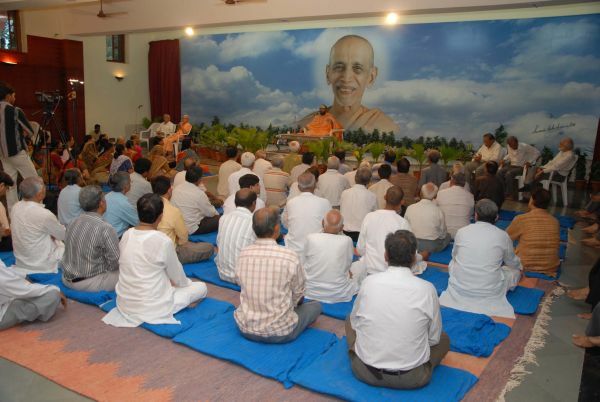 Savalkshya Bilva patras Archna (offering) Pujan was performed by ashram and four yajman during the month. Every Monday after evening Maha Aarati Devotees performed special Prahar Puja. On Janmashtami Day Shiva Temple and Lord Sri Mahadev was adorned in a special Shringar. On Amavasya Day “Baba Amarnath” Darshan has also been offered at the feet of Lord Vishwanath while performing Homatmak Laghurudra Yajna performed by twelve couple. Holy Maha Prasad (Bhandara) was served to more than thirteen hundred devotees. On Janmashtami Day Sri Vishwanath Temple was decorated with forest view and also Lord Sri Lalaji ( Baby Krishna) was adorned in a beautiful Shringar. At Sri Krishna Prakatyotsava celebration Sangeet Vibhushan Pandit Shri Nirajchandra Parikh, Sangeet Ratna Ms. Himani Vyas, Smt. Ami Parikh and Pandit Martang Parikh presented Sri Krishna Rasamrut with devotional songs from 9.00pm to midnight at 12.00 am then Maha Aarati and prasad was distributed to the devotees. Sri Chidananda Smruti Vyakhyan - on 1st Punya Tithi of Sri Swami Chidananda Memorial Nine Lecture Series On the Holy occasion of First Punya Tithi Aradhana day of Worshipful Guru Bhagawan Sri Swami Chidanandaji Maharaj, Sivananda Ashram, Ahmedabad organized five day lecture series on Vedanta by highly learned Mahatma Saddarshanacharya Dr. Sri Swami Muktananda Puriji Maharaj ( of Sri Harkeshpuri Ashram, Todarpur, Alwar, Rajasthan). 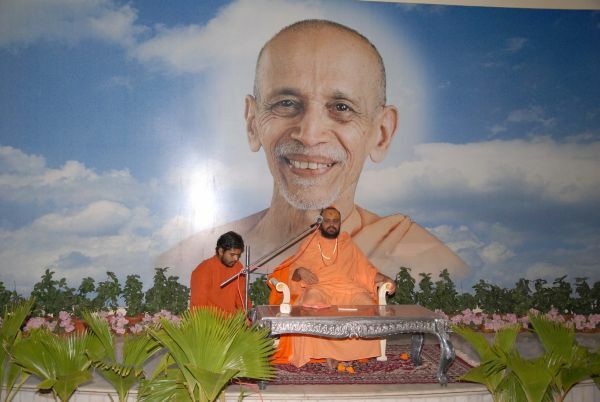 Dr Swamiji Maharaj’s discourses were organized from 14th August 2009 to 18th August 2009 everyday evening 6.30pm to 8.00pm. on “Vivekachudamani” and from 15th August 2009 to 18th August 2009 from 7.00am to 8.00am. on “Karma Yoga Rahasya-Gita”. A large number of devotees took benefit of this nine lecture series and took part in Sri Guru Paduka Pujan on Aug18th morning 8.30am.on first Ppunya Tithi of Gurudev. As per the demand of devotees during this series, ashram welcomes the suggestion and started “Vedant Vimarsh Varg” from Aug 28th on each Friday evening. Daily Yogasana classes, Reiki Teaching and Yogic treatment, Narayan Seva and Grain Distribution, daily night Satsang were the main activities of ashram carried out as usual during this month also. 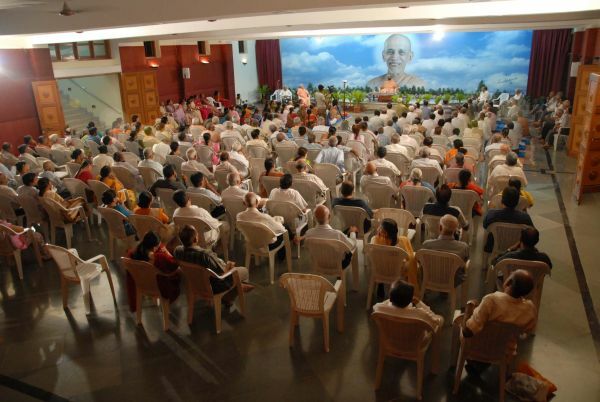 Executive Board Meetings on every second and fourth Sunday of the month met as usual and members took part actively and discussed the routine activities, special functions and other concerns related to ashram. A peace prayer offered by all the members including YTTC faculty members for the departed souls of Vaid Rajal Shukla’s (Ayurved), Dr. Ina Patel’s father and Ashram’s well-wisher Advocate Sri Surya Prakash Raju’s mother Smt. Sitabaa’s passing away recently.